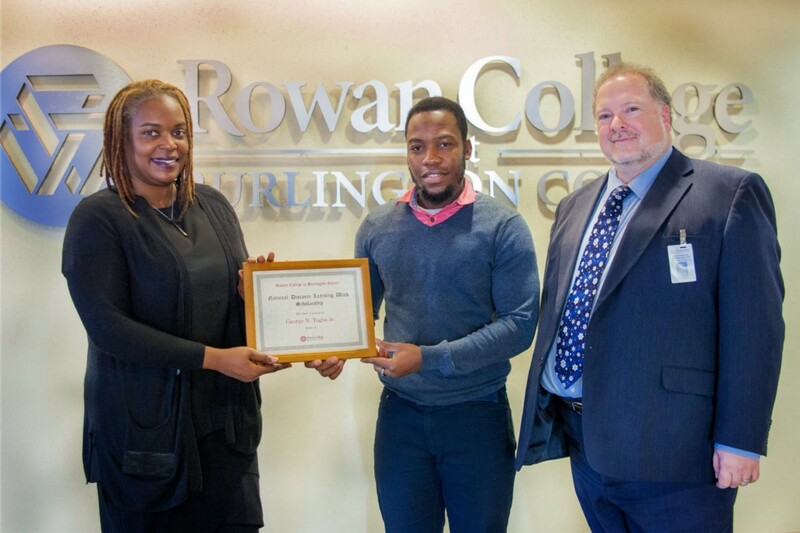 George N. Togba Jr., 28, of Burlington City, cites Rowan College at Burlington County’s online classes as an essential part of his success. From left: RCBC Foundation Executive Director Anika Ragins-Riley, RCBC student and Distance Learning scholarship winner George N. Togba Jr., and RCBC Dean of Distance Learning Dr. Martin Hoffman. George N. Togba Jr., 28, of Burlington City, sees Rowan College at Burlington County’s online classes as an essential part of his success. He is the winner of RCBC’s Distance Learning scholarship, which the college and the RCBC Foundation, awarded in recognition of National Distance Learning Week in November. “Online classes offer the flexibility that many of our students need, because they are working, have families, or other commitments that may make it difficult to attend class in-person. We were proud to present this scholarship to support a student’s success through online learning,” said RCBC Foundation Executive Director Anika Ragins-Riley. The father of a 4-year-old daughter, Togba works at least 50 hours a week for National DCP, a supply chain management company in Westampton, and is registered for three online classes in the spring. “Being able to obtain my education online has proven to be convenient. I am employed full-time and I am still able to attend school. I am able to make the classes work on my terms,” Togba explained. Togba, originally from Liberia, moved to the United States in 2009 for a better education and better job opportunities. He is majoring in computer management information systems and is planning to achieve his bachelor’s degree. RCBC’s distance education department is one of the largest among all colleges in New Jersey and currently offers more than 90 different courses, and 12 associate degrees and six certificates fully-online. The Distance Learning scholarship was open to all new and current students. Togba was selected from several qualified applicants, thanks in part to his essay that included advice to students on how to be a successful online learner. He listed effective time management as the most important aspect to online learning. For more information on RCBC’s online offerings, please visit rcbc.edu/distance-education. There is still time to sign up for RCBC’s spring semester. To register online, visit rcbc.edu/WebAdvisor.